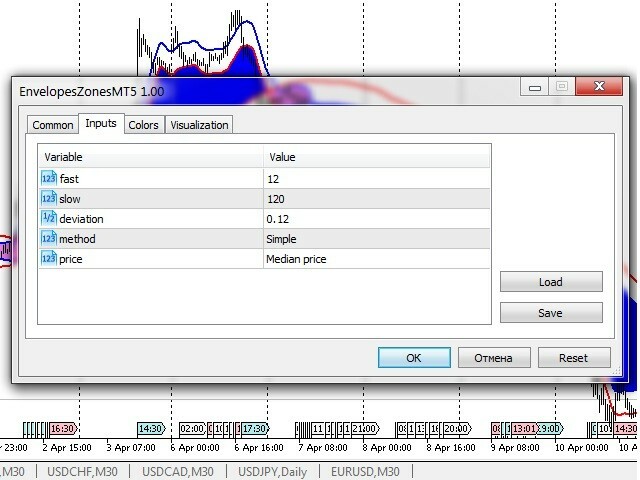 The EnvelopesZonesMT5 indicator is a combination of two Envelopes indicators. As a result several zones are formed. The first zone is limited by two slow lines (red and blue color). This is zone 1 in the screenshot. It represents a terminator of upward and downward trends. The second zone has blue color. This is zone 2 in the screenshot. This zone has an affirmative function. When the price is located below the first zone and the blue zone, it indicates a downward trend. When the price is located above the first zone and the blue zone, it indicates an upward trend. The third zone has pink color. This is zone 3 in the screenshot. Perhaps this is the main zone. 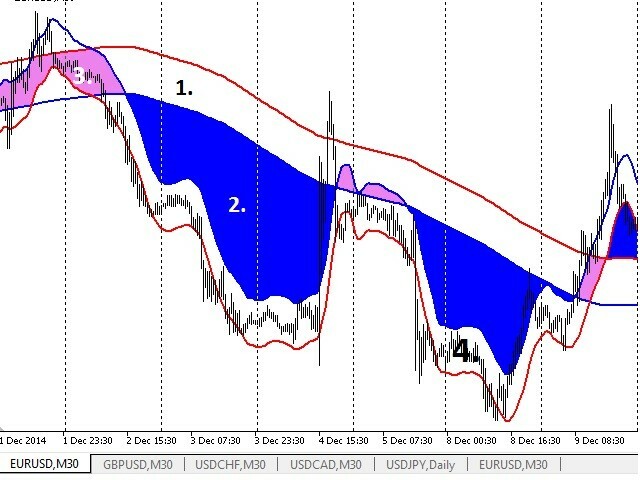 If the price is in this zone, it is time to look for a possibility to enter the market in the trend direction. The fourth zone is limited by two fast lines (red and blue color). This is zone 4 in the screenshot. They have a function of overbought and oversold levels. Reliability of the third and the fourth zones increases if they are confirmed by support/resistance levels or levels of Fibonacci. price — price used to calculate the indicator.